Prosecutor Bill Montgomery has fueled our mass incarceration crisis. Take Action Now. There will soon be a vacancy on the Arizona Supreme Court and we’re deeply concerned that Maricopa County Attorney Bill Montgomery is vying for the seat. Bill Montgomery has helped fuel Arizona’s mass incarceration crisis by advocating for the passage of laws that put more people into prison for longer periods of time and aggressively fighting against every meaningful attempt at reform. Additionally, Montgomery has allowed prosecutorial misconduct to go unchecked. He has not been fair and impartial in situations where lives are on the line. We need you to let the Commission on Appellate Court Appointments know that you’re concerned about Bill Montgomery’s destructive civil liberties record. Tuesday, February 26, 2019 is the last day the commission will accept public comments before they make their recommendation to Gov. Ducey after March 1. 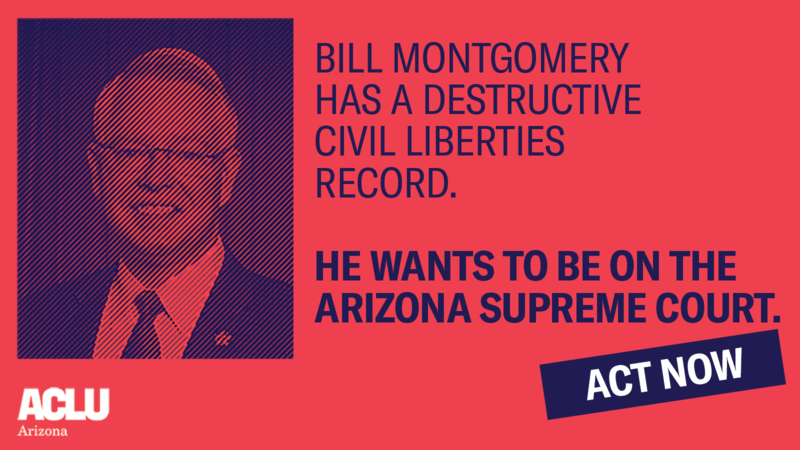 I have serious concerns about Bill Montgomery, one of the applicants for the Arizona Supreme Court vacancy. Bill Montgomery has been the Maricopa County Attorney since 2010. In this time, Montgomery let prosecutorial misconduct go unchecked in his office by failing to adequately discipline prosecutors who act unethically. In fact, the Arizona Supreme Court found one of Montgomery’s top prosecutors, Juan Martinez, repeatedly engaged in misconduct in two separate death penalty cases. Prosecutors are the most powerful people in the criminal justice system and when misconduct occurs, liberties are lost and lives are damaged. Yet, Montgomery continues to foster a culture of impunity when his prosecutors engage in misconduct. Here’s another example of Montgomery violating Arizonan’s civil liberties. After Arizona voters approved the Arizona Medical Marijuana Act, Montgomery argued that Maricopa County could deny Arizonans access to needed medicine by refusing to issue zoning documents to medical marijuana dispensaries. Plus, Montgomery hired a virulently anti-Muslim activist, John Guandolo, to indoctrinate law enforcement officers, ignoring the protestations of Muslim community members and civil libertarians who believe in the U.S. Constitution’s protections for religious freedom. Finally, Montgomery played a key role in fueling Arizona’s mass incarceration crisis. A recent study by Fwd.us found that Maricopa County sends people to prison for longer periods of time than any other Arizona county. The study found Montgomery’s office is using the repeat offender enhancement far more than other counties in the state. I hope the Commission on Appellate Court Appointments will consider these concerns during the March 1 interview of Bill Montgomery and subsequent recommendations to Gov. Ducey.